I’ve been neglecting my knitting a bit lately, partly because of work and partly because I’ve been spending my off hours cooking up a storm. But I declared this weekend to be Knitting Weekend and made some notable progress on the rest of my startitis projects. I turned the heel on my embossed leaves socks. Speaking of which, Claudia finished hers! Yay! This was my first attempt at a short-row heel, using Wendy’s double-wrap short-row heel method, and I think it worked out pretty well. Except for that part when I interpreted “knit” as “continue in pattern” and had to rip and re-knit one of the heels as punishment for inability to read. The whole thing was much less fiddly than the flap-and-gusset heel. I was worried the heel wouldn’t be deep enough, but it looks like it fits ok. It fits better than the heels on my straight-laced socks at any rate. And I completed the body for the cable and rib hoodie for Dulaan. Knitting Weekend must break for a bit now, so I can grade the 60-odd student papers in my backpack. CogKnition posted this on September 24th, 2006 @ 12:26pm in Knitting for Charity, Unfinished Objects | Permalink to "Weekend Knitting Extravaganza"
I love those! 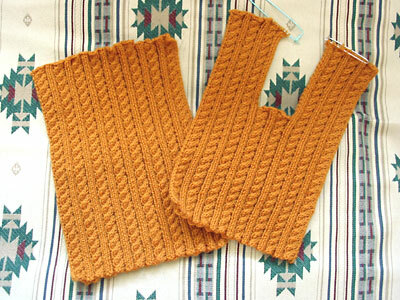 It almost made me forget how much I didn’t like knitting that pattern, and want to do it again! Ohhhh so beautiful, your socks!! I think I may have to get me some light blue yarn too!! :-)) Can’t wait to see them finished!